No More Dirty Looks Puts Schmidt’s Deodorant To The Test. 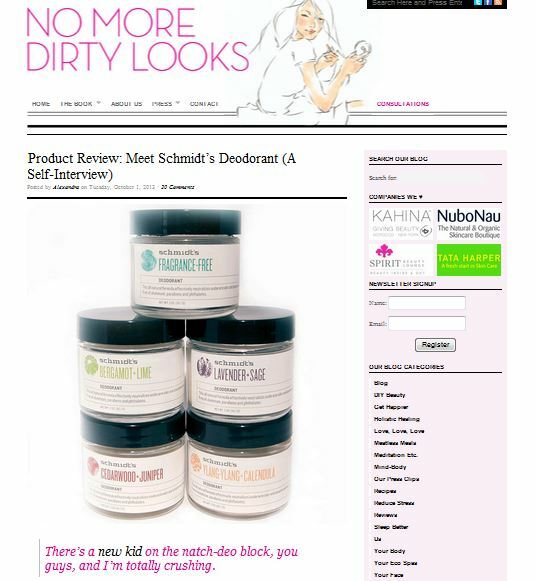 The esteemed natural beauty experts at No More Dirty Looks give Schmidt’s Deodorants a good run- and they were impressed! “Schmidt’s does a few things things incredibly well. The first is packaging. It’s simple but sophisticated. And, I’m not being a hater, but this category is not exactly known for its elegant packaging design. Also, while you still need to use your finger for application, I like that there’s a small spatula in the jar. It’s just a less messy process.”.… click here to keep reading the full article. Previous Previous post: Schmidt’s Deodorant Launches At Whole Foods!